Leversedge Telecom Services is supplying AAH Pharmaceuticals, the UK’s leading distributer of medicines with voice and data communications for its new fleet of temperature-controlled Ford Transit vans; the PharmaVan II. The new vans are born out of AAH’s commitment and determination to deliver a first class, reliable service, providing customers with the best in pharmaceutical distribution so that they can meet the needs of their own communities. 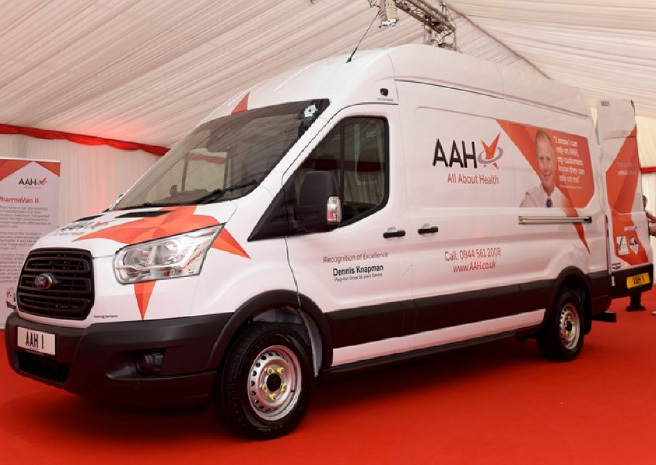 AAH’s fleet consists of 896 Transit vans, it will introduce 340 PharmaVan II models within six months and aims to complete the rollout of the new vehicles by the end of 2017. The fleet will be the most technologically advanced pharmaceutical vans on the road, having been built exclusively for AAH through specialist partners, ensuring product is delivered within GDP 2013 guidelines. Leversedge are suppliers for AAH, installing and preparing these revolutionary new vans, fitting: The CCTV system and back up, Fuel monitoring system, Epod cradles, Vehicle tracking systems and driver behaviour modules, installing secure fridges, fitting and verifying 4 x temperature probes as well as designing the control panels to bring all the technology together. Each AAH van will be fitted with a transcan unit linked to the Seven Eye website, allowing drivers to constantly monitor the temperature of the fridge, which is maintained between two and eight degrees, and the cargo area, between eight and 25 degrees. The fridge and cargo area, which are independent of each other, continue to operate while the driver makes deliveries, and curtains have been installed to help maintain temperatures. The telematics system also tracks the van’s progress and reports delivery times back to the AAH branch. The drivers will additionally have inside, rear, forward, and two side cycle cameras for their security as well as reversing sensors with a front mirror camera display to assist with reversing and manoeuvring. Each vehicle comes with a full reporting suite and key AAH personnel will be able to track the vehicle’s every movement as the driver is on the road. Temperatures will automatically be logged with real time temperature recording which is visible to the AAH Branch and Distribution network; an audible alarm will be triggered, and group email alert generated, if there is any deviation of temperature. An alert notification has also been added which will signal when the doors to the cargo area are open.